Join us for one of our regular scheduled programs, and you’ll find unique experiences, entertainment, and engagement unlike any other in the St. Louis area! The List below gives the details for each of our recurring events. You can also find this info on our Emerald Room Calendar! Fresh Produce is a live monthly beat battle every first Wednesday. Fresh Produce aspires to bring the Producer to the forefront creating a community of music lovers to push the boundaries of the beat. The show is also produced live on Facebook and on our website freshproducestl.com. Keep the Heads nodding. 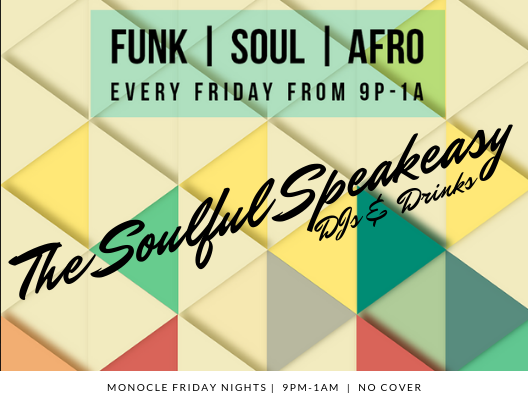 Join the Monocle Crew plus DJ High Rent & Matthew Sawicki of Fresh Produce STL for groovy vibes late night on Fridays in the bar. The DJs will be laying down the funkiest soul beats while the bartenders shake and stir up some delicious drinks! Grab your pals and come chill! The Monocle welcomes Coffee Break Comedy Showcase on the second Friday of each month for a few laughs and chuckles. Hosted By Yale Hollander, Coffee Break Comedy Showcase Features the top comedic talents from St. Louis and beyond! Tickets are $10. Join us for an up-close-and-personal burlesque experience, unlike anything in St. Louis! This cheeky cabaret features The Bon-Bons, a delicious assortment of burlesque beauties. While each member brings a unique style and sensibility, all of them are dedicated to sass, class, and old-fashioned showgirl charm. Show times are at 8pm & 10:30pm on the Second Saturdays of the month. Tickets are $15 at the door. Join Rayne Supreme & her high flying friends for Mercuriosity: Wednesdays in Outer Space, at 8pm on the third Wednesday of Every Month! This unique and never-before-seen monthly show features your favorite local aerialists and interactive dancers doing their own variations on a theme. $5 cash at the door! The Monocle is thrilled to host The MVMNT Lounge with PRYR on the 3rd Saturdays of every month starting in March 2019. This amazing jazz fusion group is mesmorizing audiences with their unqiue blend of music styles. PRYR, the brainchild of tristaño and Dhoruba Shakur, are releasing their self titled debut EP. PRYR blends elements of American jazz and Hiphop to create a sonic landscape that is both modern and truly their own. They will be joined by some of the strongest improvising musicians in the community including trumpeter Brady Lewis, guitarist Ian Lubar, and violinist Alyssa Avery. The Emerald Room begins seating at 10pm. Music starts at 10:30pm. $5 cover. Sponsored by The Monocle & Fresh Producer STL. DJ High Rent & Matthew Sawicki will be spinning some pre-show jams in the bar from 9-10:30. Get there early to grab a cocktail, mocktail, beer, or wine to set your groove for the lounge! Join us on the 4th Wednesday of every month for the city's wildest karaoke night, BURLYEOKE, where showgirls strip while you sing your heart out! Entry is $5. Featuring the magnificent Brian McClelland with Karaoke BOOM. Open karaoke begins at 8pm till midnight. Burlesque sets at 9:30 & 10:30pm. Produced by Dolly G Whiz Productions in association with The Monocle.